Flowers of the Forest! by John Buckstone. Cynthia (left) is played by Céline Céleste, Lemuel by Sarah Jane Woolgar, and Starlight Bess (right) by Fanny Fitzwilliam. John Baldwin Buckstone (1802–79) was a comedian and writer of farces with a secondary line in melodrama. The Flowers of the Forest, one of his best known melodramas, premiered at the Adelphi Theatre in 1847. It turns on the trial of an innocent gentleman, Alfred, for a murder that was really committed by a Gypsy boy, Lemuel. 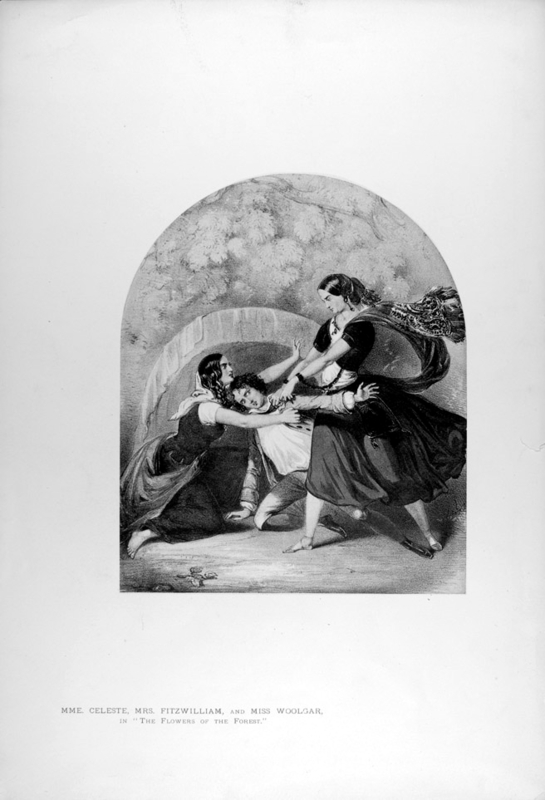 In this climactic scene from the third Act, two young women struggle for control of Lemuel’s person. 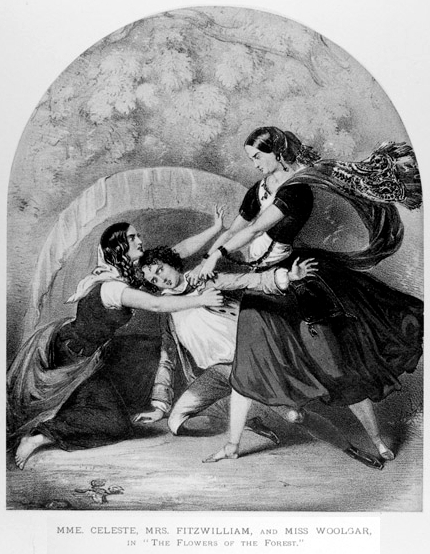 Cynthia (left), an Italian Gypsy who harbours a selfless love for Alfred, has just dragged Lemuel out of his tent: "Come away — you shall, and prevent the shedding of innocent blood!" But Starlight Bess (right), who is Lemuel’s lover, is determined to save him from the gallows; she shrieks at Cynthia: "Let him be! Take off your hold! What if he did do what he says; we care for none beyond our own people!" Lemuel himself vacillates between honor and self-preservation. "Bess, save me!" he wails feebly. Cynthia taunts him: "You cannot move! Your guilt makes you as weak as a child." Agitated action music is heard throughout the scene. All three parts were played by women in the first production: Cynthia by Céline Céleste (1810/11–82), a French actress who made her career in Britain; Bess by Fanny Elizabeth Fitzwilliam (1801–54); and Lemuel by Sarah Jane Woolgar (1824–1909). Dickens spoke of Woolgar’s performance as the "the most remarkable and complete piece of melodrama" he had seen. N.T.